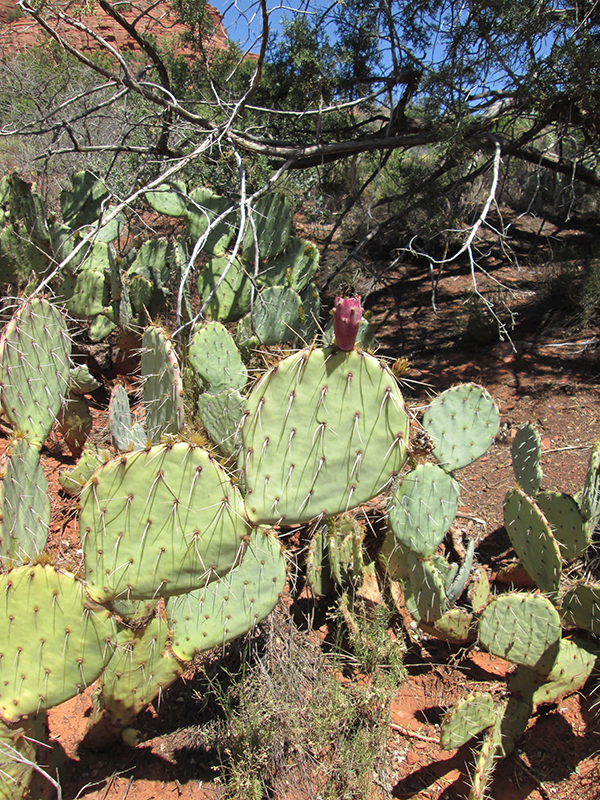 There is a lot of prickly pear cactus on my trails. Most of the time if you stay away from the cactus, it will stay away from you. That’s how we get along, that cactus and I. 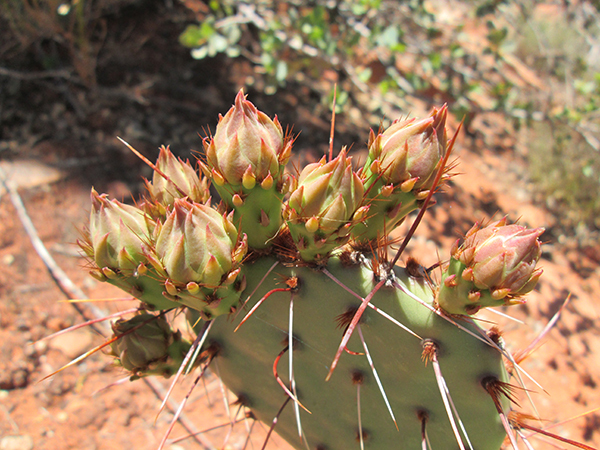 All winter that cactus sits around and doesn’t do much of anything – except maybe get eaten by javelina. But in the spring the prickly pear has blossoms. They’re not quite here yet. And it will be bad when they do come out because my person will stop and take all kinds of pictures of them. 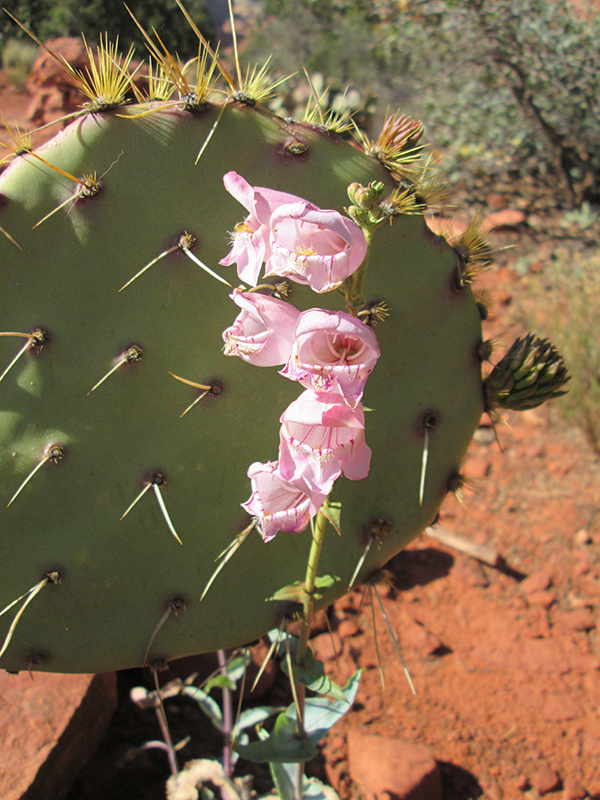 The prickly pear around here don’t have pink blossoms. If I were a pink flower I would not be growing there. But back to the prickly pear. In the fall they have fruit. But I found this one prickly pear that doesn’t seem to know what time of year it is. Or maybe this prickly pear is trying to be my friend. This one cut right to the fruit. Epicaldragon, as long as that cactus doesn’t have flowers on it for my person to take pictures of, it’s alright in my book. Marina, good idea. I don’t even leave messages on those things. Those prickly pears may have flowers and they may have fruit but sure as heck they definitely got big prickles. Now do yourself a favor and don, t try leaving messages to your friends on these pears. Patrecia, my friends and I have a deal with those cacti. Nobody leaves messages there and they don’t stick us. Those things look wicked sharp, B. Don’t try licking the fruit unless your tongue has a really good aim…. Cupcake, the fruit has pricklers too. I’m staying away from it all. We love cactus but they could get ya! Lily & Edward, cactus is good from a distance. Pigs, you’ve definitely got to watch those points. Good advice there Bongo – you keep your distance from that friend & he will be a good friend to you. Diane, now I’ve just got to convince my person to keep her camera at a distance from them. Oh yeah, she wouldn’t like a needle in the yea! Great last line there Bongo! Excellent play on words. 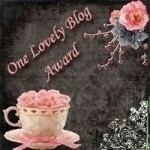 I love that the cactus understand the problems with your humum and are going out of their way to help you! 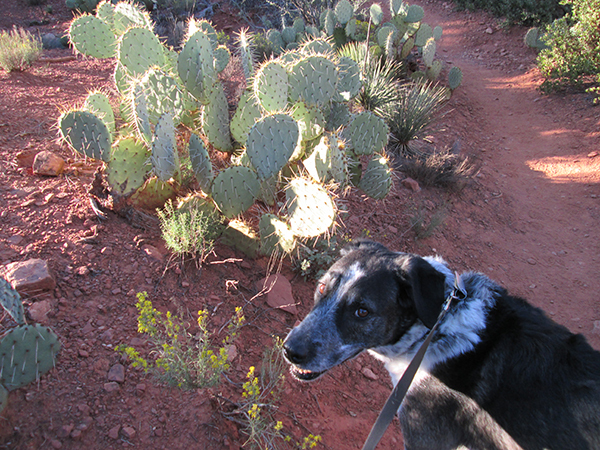 Dalton, as long as you keep your distance, the cacti around here can be pretty cool. Fredrieka, you’ve definitely got to keep your distance. Kevin, I think a lot of stuff around here is confused. While most of the world was getting extra winter this year, we weren’t getting any.